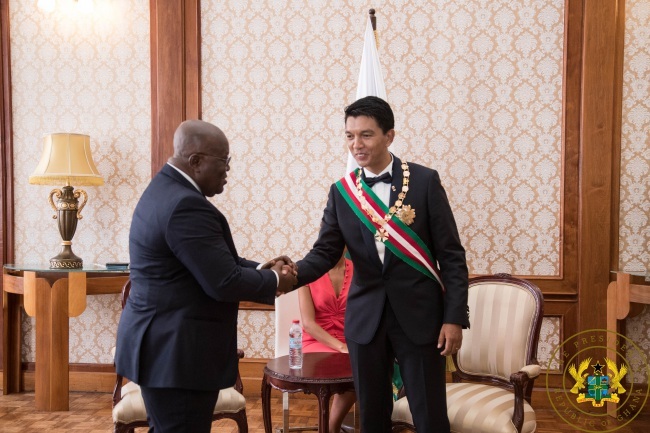 The newly sworn-in President of the Republic of Madagascar, His Excellency Andry Nirina Rajoelina, has commended President Akufo-Addo for the superintending over impressive developments in Ghana over the last two years. President Akufo-Addo assured President Rajoelina of the Ghanaian people’s continued solidarity with the people of Madagascar and pledged to do his best to deepen the ties of co-operation, friendship, and trade between the two countries. President Akufo-Addo returned home from Madagascar on Sunday, 20th January 2019.